London is constantly growing and changing. And, although the Big Smoke has been around for two millennia (the first major settlement founded by the Romans in 43AD), new architecture is continually incorporated into its cityscape. Here’s our walking tour through the best contemporary landmarks in London. 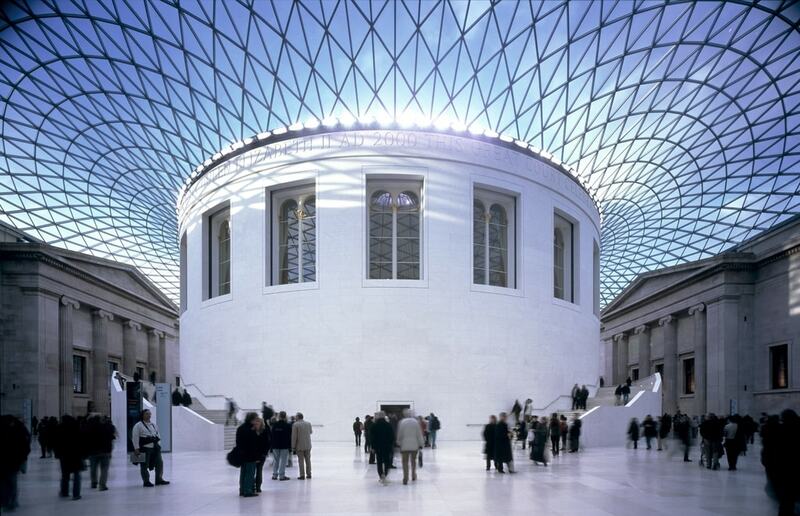 Start the tour inside the magnificent Great Court at the British Museum near Russell Square and Holborn tube stations. Designed by Foster + Partners, this two-acre space – enclosed by an enormous glass ceiling – was opened in 2000 and is the largest covered public square in Europe. In Robert Smirke’s original design for the museum, he had wanted the area to be a garden – but the space was lost in the 1850s when the Reading Room and a number of bookstacks were built to house the museum’s library department. It was only in 1997, when the library was moved to British Library building in St Pancras (a 20-minute walk away, if you have time), that plans were put in place to re-open the court to the public. 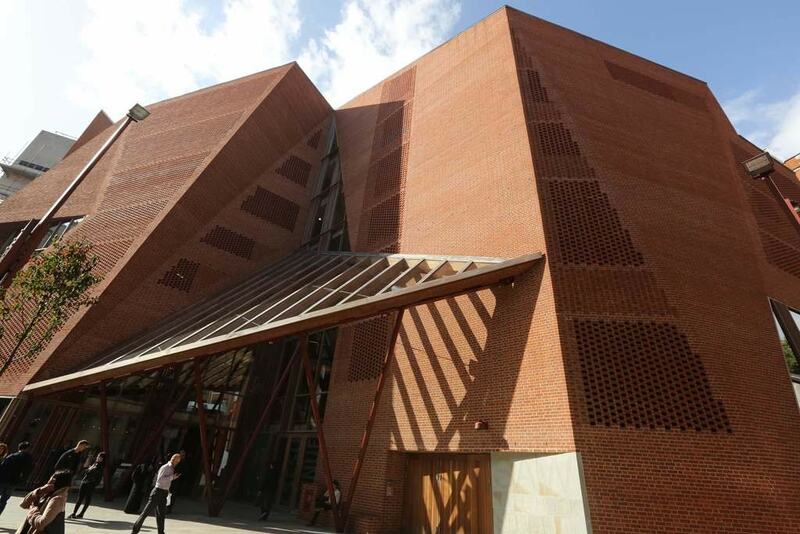 Walk 15 minutes southeast to the LSE Saw Swee Hock Student Centre – probably the coolest-looking student hangout in the country. This jagged, red-brick building, complete with a perforated façade, was designed by Dublin-based practice O’Donnell + Tuomey and stands out among the hotchpotch of older buildings nearby. Opened in 2014, the student centre houses a bar, conference space, café, gym, dance studio, and pub. 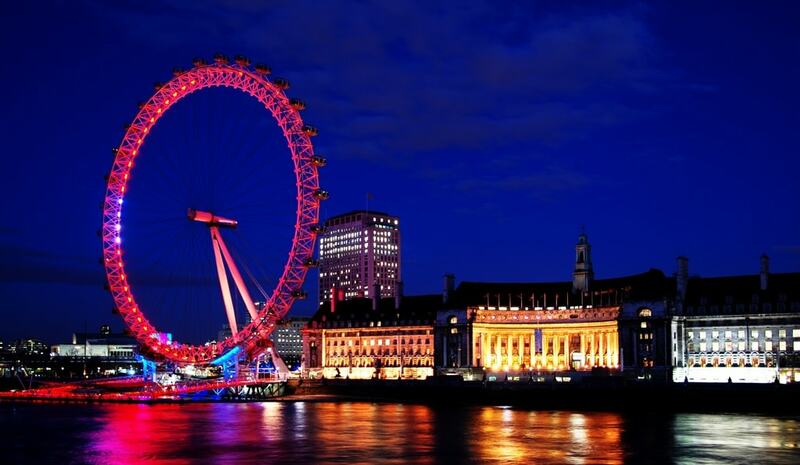 Stroll south over Waterloo Bridge – from where you can see a number of London’s contemporary landmarks, including the Shard and the Walkie Talkie Tower – to the London Eye. The giant structure was designed by Marks Barfield Architects and was the tallest Ferris wheel in the world when it opened, but was surpassed by China’s 160-metre high Star of Nanchang in 2006. Amble along the Thames waterfront for 15 minutes until you get to the Tate Modern Switch House. This ziggurat-shaped building is characterised by its red-brick latticed exterior (apparently a fowl consultant was even brought in to ensure the gaps were too small for pigeons to nest in). Opened in 2016 to the designs of Herzog & de Meuron, this extension was delayed by four years (it was originally meant to open in time for the Olympics) and went massively over budget – but it was arguably worth the wait. Head up to the free public viewing gallery for great views across London. 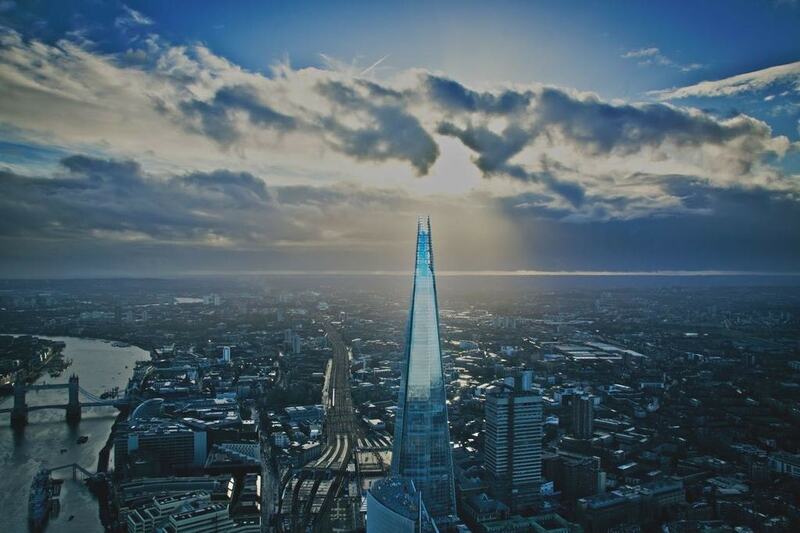 Next, walk for 15 minutes south-east to the Shard, designed by Renzo Piano. This 95-storey skyscraper towers over London like an elongated pyramid and is the UK’s tallest building (as well as being the highest building in the European Union). Top tip: don’t pay to go up to the viewing platform, instead buy a drink at cocktail bar GŎNG on the 52nd floor – it’s London’s highest bar and has just as good views. Go northeast for 15 minutes to the Walkie Talkie, or 20 Fenchurch Street. Love it or loathe it, the 34-storey building certainly stands out among London’s modern landmarks. Dubbed the ‘Walkie Talkie Tower’ for its distinctive shape, it was completed in 2014 and designed by Uruguayan architect Rafael Viñoly. If you book ahead, you can also visit the tower’s Sky Garden at the top – a free public viewing gallery with panoramic views across the capital, including Canary Wharf. Just five minutes from the Walkie Talkie tower is the Gherkin (30 St Mary Axe), another Foster + Partners designed building, which has had a big impact on London’s urban fabric. 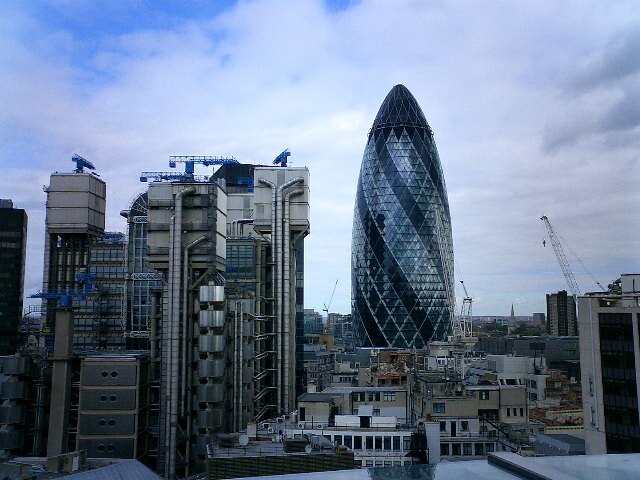 Completed in 2003, a whopping 7,429 panes of glass were using to construct the Gherkin, with the dark and light glazing creating a spiralling effect on the outside. The 41-storey building is designed to be environmentally efficient and has gaps between some of its floors which provide a natural ventilation system. It won the Stirling Prize – the UK’s biggest architecture award – in 2003. 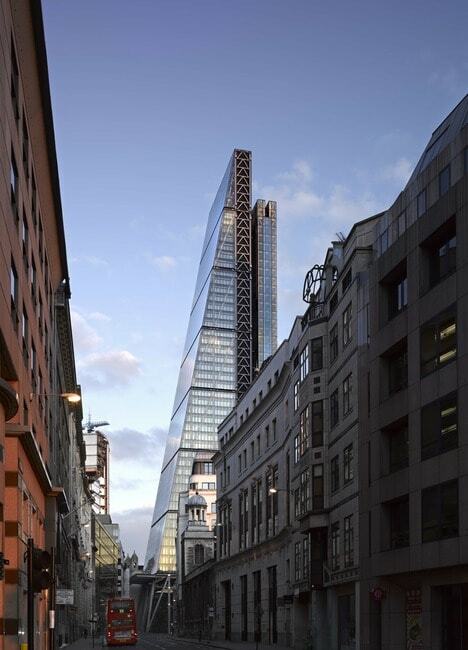 Head around the corner to the final stop, the Cheesegrater (officially known as the Leadenhall Building). Designed by Rogers Stirk Harbour + Partners, whose office is in the tower, this wedge-shaped 48-storey skyscraper became a memorable addition to the London skyline when it was finished in 2013.